We’re back today with Ellie’s second point of view chapter. Thanks for sticking with us this long, and if you don’t want to wait any longer, don’t forget you can purchase a full copy of the novel on Amazon here. She sat in the same booth she had when Gertrude first opened her eyes to the truth of the world only yesterday. The air had the same stale, smoky smell, and most of the same people were there. That is, everyone who was there now was there last time, but not everyone who was there last time was there now. Ugh. Did it really matter? She was just distracting herself from the reality of the situation. That woman—the Scientist as she like to call herself for some egotistical reason—she was the one who had really given Ellie the opportunity. She had given her more than just an opportunity, though. She had given her responsibility. What else was opportunity but the responsibility to put that privilege to use? The Scientist had said that she could fulfill Ellie’s desire to see the beach. She looked a little upset when Ellie asked for it, but Ellie didn’t care. She had always promised her son that she would take him to the ocean, and even though he wasn’t alive to see it for himself, she still wanted to hold true to that promise. But would she stay out there forever, or would she come back to help the Scientist fight for freedom? “Fight for freedom” though? Ptuh. Ellie didn’t even know what that meant. The Scientist wasn’t specific about it, either. But that’s what this meeting was supposed to be about, right? To get the specifics about what she was supposed to do for “the cause”. And they didn’t even know when she was supposed to do whatever it was she was supposed to be doing. It didn’t give her much confidence in the plan she was becoming a part of. Her beer was getting low and it was a bit past the time she was supposed to be contacted. She swirled the dregs of her drink around and took a small sip, surveying the room again. It was still just the regulars, no one she didn’t recognize. Who would the Scientist send, anyway? They would have to be able to keep a secret to be a part of the Scientist’s organization, so the anonymity of her bar would be protected, but how was she supposed to recognize the person other than the fact that she didn’t recognize them? She topped off her beer and thought about leaving when the door opened and in came Gertrude, walking like she owned the place. She went straight to the bar and ordered without looking over at Ellie in the corner booth. Maybe she hadn’t seen her. “I thought you understood I meant from yourself as well.” Ellie smiled. “Get it out of me?” Ellie said, raising an eyebrow. “Tomorrow?” Ellie’s faith in the plan dwindled a little further. “Fifteen minutes isn—” Ellie said. “That’s what I’m saying,” Ellie said, taking a drink of her beer. “Fifteen minutes is more than most people get, sweetheart. Most people never get to see the other side for their entire life. The other sides, Ellie. There are more than just two.” Gertrude had gotten a little loud so she looked around to see if anyone was listening. Ellie knew she was right, though. Gertrude was risking herself just to give Ellie a chance that no one she had ever known had ever had. And what was Ellie doing? She was complaining that they weren’t giving her enough time. She could take all the time she wanted, she only had to worry about surviving over there on her own to do that. Who was she to be upset at Gertrude for passing on information, anyway? “Have you ever seen it?” Ellie asked. “You mean the—er—revolution.” The word tasted bad in Ellie’s mouth, it was hard to spit out. She took a sip of beer to get rid of the aftertaste. “Digital trail?” Gertrude seemed to be talking in code. “But what part am I supposed to take in all this?” Ellie still didn’t think she had any valuable skills. “It’s simple. You take these.” Gertrude set a pouch on the table. “Each one is a little disc with a red button. You take the paper backing off, stick each disc to each door in your hall, and press the red buttons to activate them. After that, you have ten minutes to get out of the building or you’ll be there when they…blow up.” She whispered the last two words. “Blow up?” Ellie whisper-yelled back. “Explosives!” Ellie said too loudly. Gertrude laughed unnaturally loudly herself in response. “Ha ha ha! Yes! An explosive drink that one. I’ll order two.” She slapped her hand on the table and stood to go to the bar. Explosives? The Scientist wanted her to blow up the QA hall. That was her “opportunity”. What kind of opportunity ended with her destroying her workplace, her entire means of existence? That was no opportunity. That was payment. That was stupid. Why would anyone ever agree to it? The Scientist should have come out with that from the beginning. No. She wouldn’t do it. Especially if she could go spend fifteen minutes on the beach and come back to her normal life either way. But what kind of life was that? Working for the people who had killed her son until she could find some other way to get back at them. Well here was a way to get her revenge right now. Gertrude sat back at the booth with two tiny glasses. She set one in front of Ellie. “Cheers,” she said, holding up her own tiny glass. Ellie picked up the tiny thing, tapped it against Gertrude’s, and downed its contents in one gulp. Living up to its name, it burned all the way down her throat and made a fireball in her stomach. “Explosive,” she choked out. “This sounds too good to be true,” Ellie said, shaking her head. “So her power’s not endless,” Ellie said. “No one’s is.” Gertrude shook her head. “I hope you’re right.” Ellie shrugged. “Thanks, Trudy,” Ellie said, putting the address and the pouch in her pocket, careful not to press any of the buttons on the discs inside. “You have a good Christmas, too.” She didn’t think she’d be visiting the old lady, but she did appreciate the gesture. “I will, dear,” Gertrude said. “Bye.” She waved as she left. 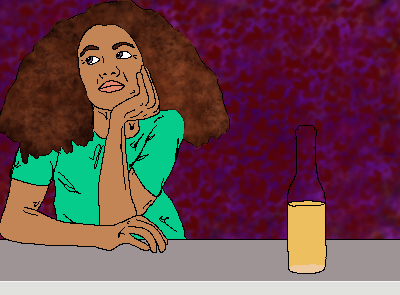 Ellie sat staring at her empty glass, deciding between getting another here or drinking one at home. Ugh. Why did Gertrude have to be such a nice, likeable, good person? It was so much easier to hate her for what she appeared to be than to truly get to understand who she was. But now that Ellie was starting to know who she was, it was impossible to hate her. It was impossible not to see her as an omen of the future, too. An omen of Ellie’s own future. She never thought she was being moral unless she was furthering the struggle. What was that? Was she being pious or honest? Was she lording superiority or offering her actual opinion? Ellie shook her head. No. Gertrude was helping. She was saying what she honestly believed. Ellie was taking out her frustration over the decision she had to make on Gertrude. She needed a drink to settle her nerves, and she didn’t want to stay out in public with a pouch full of bombs in her pocket, so she decided that going home was the best option. When she looked up from her glass, the bar was empty except for her and the bartender. She brought her glass to the bar and thanked him, then headed out into the cool, dark air. The street was just as empty as the bar. Everyone was home with their families, even Gertrude. Trudy. There was an elevator between Ellie and home, but the cool air and exercise was welcome, so she decided to walk down Elysian instead of taking the shortcut. What was morality anyway? Nothing. Anything. Whatever you made of it. Gertrude thought the struggle was moral. The Scientist did too, probably. And her classes and church had taught Ellie that toil was moral, work was honorable. But what did they have to say about the price she had paid? What was moral? That was a hard question to answer, no doubt. But she did know what wasn’t moral. She knew the way they worked and toiled to produce things they would never see was immoral. She knew the loss of life for that production was immoral. She knew those things were wrong, but what was right? Fighting against that had to be right, didn’t it? Fighting against the immoral, righting wrongs. How could that not be moral? How could it be? She groaned and wished she had taken the elevator. She needed that beer now more than ever, and two blocks was still too far. Out of the corner of her eye, she caught the sight of a small, dark form, running along beside her to sit down directly in her path and meow. “Git!” she yelled, stomping to shoo it away. The cat ran a little further down the street and meowed again. The cat waited until she got a few steps away then ran off ahead again. When it got to Ellie’s apartment, it rubbed its face on the door jamb as if it knew she were going in that one. Ellie kicked it away when she got there. “Shoo,” she said as she opened the door, but the cat ran through her legs and up the first flight of stairs. “You’re not coming with me,” she said, climbing up after it. “And now you’re locked inside.” She chuckled. When she got almost to the top of each flight, the cat ran up to the next. It licked itself a few times, and ran up to the next, licked itself as she climbed, then ran up to the next, all the way to the top floor where Ellie lived. She slipped through the door as quickly as she could and slammed it shut, ensuring the cat couldn’t follow her. Satisfied, she carefully slipped the pouch out of her pocket and set it on her dresser. With a sigh, she crossed back to the fridge to get a beer—her last one—then collapsed onto the bed. This was her home. One room and a bathroom. Her bed was on the same wall as the door, and when you walked in, you walked straight into the fridge. There was room enough between the fridge and the bed to walk, but not to open the fridge all the way. On the other side of the fridge was the door to the bathroom. The dresser was at the foot of the bed, and the last wall had a counter with two stove tops and a sink. She took it all in, sighed deep, and sipped her beer, staring at the pouch on her dresser. There went her long weekend. At least she would still get Monday off. Or she could be sitting on the beach, fishing for food, and sleeping under the stars, instead of sitting in this tiny room. Could she do that? Could she set bombs in the QA hall and blow the place to bits? That she thought she could do. She wouldn’t feel great about it, a little vindicated maybe, and it would never bring her son back. They would probably never even know it was her who did it, but then she could at least say that she had done something, changed something, affected something. And it’s not like anyone would be hurt. It would be a few halls, one building. That’s it. But that wasn’t it. There was a concerted effort. She was just a piece in a bigger strategy. A pawn? No. Pawns didn’t have a choice. Did she have a choice, though? Gertrude had made it sound like she did, but she made it sound like she didn’t, too. She was full of contradictions. This entire thing was. Ellie’s understanding of it was continuously in flux. She wasn’t sure if Gertrude was a senile old lady, not worth the time of day, or a wise old soul, sent to guide her on the path to morality. Pffft. Here came morality again, creeping its ugly head into the conversation. There was no morality. Even if there was, no one cared. Morality only works if it’s reciprocal. Unless others are moral, you have no room to be. Then again, if no one is ever moral, then no one will ever be moral. Another contradiction. What came first, morality or the moral? She took a big swig. Moral didn’t matter. What mattered was what she was going to do. Gertrude’s morality had no bearing on that. Gertrude and the Scientist had done all that they could to get her there, now it was up to her to walk through the door. She sighed again, but this time it was a sigh of relief. Tomorrow she would finally see the beach, she would bury her feet in the sand, feel the breeze on her face, and on top of that, she would throw a wrench in their machine on her way out. She took another swig and caught some movement out of the corner of her eye. There on her counter, rubbing its face on her sink faucet, was the black cat from outside. “How did you get in here?” she said, opening the door and going around the bed to shoo it out. “How did you even get in here?” She stomped her feet, but the cat stayed under the bed. “Get out. Git!” she yelled as she stuck her hand under the bed to shoo it out the door. “And stay out!” She jumped over onto the bed to slam the door closed. Stupid thing. That was strange. But the bed was so comfortable. She might as well try to catch a few winks. It was somehow harder to wake up on Sunday than on any other day of the week, even though she normally woke earlier. But she was no stranger to doing what she had to do, and so she did it. It was harder to wake up, but the commute to work was easier to balance it out. The streets were barren, there was no line at the elevator, and the entire building was empty of employees. She checked her pocket to make sure the pouch was there as her footsteps echoed magnificently in the emptiness of the halls. She almost thought that, without all the angry employees standing around and gossiping, this place might not be half as bad as it normally was. But then she got behind the conveyor belt, expecting her normal beginning of the shift burst of work to get her warmed up for the rest of the day, and after five or ten minutes, the burst still hadn’t come. Gertrude had told her this was going to be a long shift, that everyone would be at the Christmas Feast. That meant that whoever it was that usually got their things through her conveyor belt wasn’t in their normal place. Instead, they were at some Feast. Feast? What did Feast even mean? A Christmas party? No. It had to mean more than that. Most of what came through the conveyor belts was food, and cooking utensils, and clothes. The only place people needed all those at once was at home. So it went to someone’s home. Or a store. A store that sells all three things? If you can, why not sell anything? But no. Eggs and bacon and pans and clothes together? Someone was cooking and getting dressed. It had to be a house. Ugh. She had gone through all of this before. She already knew it was a house. She still had no idea what a Feast was. She was still as ignorant as ever. But not for too much longer, now. Soon she’d experience the beach. She patted the pouch in her pocket. Would she lay the bombs? Yes. Of course she would. She knew she wanted revenge, and here was just that. Or some small piece of it, at least. But could she do more? The bell rang. Ellie jumped. The screen said cat food. Cat food? A bowl came rolling through and out the other side. Apparently someone was still at home. And now they had cat food. Ellie stared at the conveyor belt for a while longer, waiting for another quick burst of work, but nothing came. This was going to be a long shift. Gertrude’s words echoed through her mind again, setting her off on the same line of thoughts she went over earlier. She had no more idea what she was going to do when the final bell rang than when she had sat down for her shift. The cat food was the only thing that came through the entire time, and she thought she was going to die by the end of it, but the last bell went off, she looked at the screen to make sure it wasn’t more work, and when she saw nothing, she realized it was time to decide. She felt for the pouch in her pocket. It was still there. She thought about going to set the bombs so she didn’t have to come back after she had seen the beach, but she didn’t know how long it would take to set them all, and she wanted to make sure the beach was really there before she did anything. She climbed up over the railing and stood on the conveyor belt. She had always wanted to be there, and had often imagined herself seeing “Ellie” on the screen then making sure it was her who went through. She laughed a little, then remembered where she was and that she had a time limit. She crouched down and tried to see as far into the “in” port as she could now that she had a better perspective. All she could see was darkness, even from there. She tried to reach into it, but her hand met a cold, hard door. She turned to peer through the other side and there was light coming through, and a cool breeze, and the scent of salt water and fish. The beach. She crawled on hands and knees through the “out” port onto soft sand. She couldn’t believe her eyes, or her skin, as she stood with some difficulty. Before her was a short stretch of white sand with the deep blue tide beating and beating against the shore in some absurd attempt to reach dry land. She dug her feet into the smooth, fine pebbles and brushed her hair—which had been blown into her face by a cool ocean breeze—out of the way, smiling like she hadn’t smiled since her son had gone. Since Levi had gone. He would have loved to see this, to feel it, to smell it. She fell down on her knees in the sand and started to weep. She was here. This was it. The one promise she had made to Levi and she had fulfilled it too late. It wasn’t enough. Fifteen minutes wasn’t enough. She had to take it all in, experience all of it. She had to do it for him. She knew it. This was moral. Keeping her promises. But she couldn’t stay here without paying the price. She owed it to Gertrude and the Scientist. She had to keep her promises to them as well. She struggled to her feet and stared out again at the endless water and the endless sky. She almost wanted to forget the bombs entirely. Ellie was going to ignore the person, but hearing the Scientist’s name intrigued her. Plus, as he came closer, he didn’t look like any threat she couldn’t handle. “Hello! Do you hear me?” he called when he was close enough that she obviously did. He kept talking, but Ellie wasn’t listening. She crawled back through the conveyor belt, and his voice disappeared behind her. She jumped down off the belt and the floor felt so much harder after the softness of the sand. How much time did she have left? She sprinted out the door, slammed it shut, jerked the pouch out of her pocket, and fumbled through it for one of the discs. She didn’t know what to do with the pouch while she set the bomb so she dropped it on the floor. Rip, stick, press? Rip, stick, press? As if. The paper backing on the disc was impossible to get off. It took ten, fifteen attempts, especially with her hand shaking at the fear of missing her time limit. She finally got it off, stuck the disc on the door, and pressed the button which turned green and displayed a little clock counting down from thirteen. Thirteen minutes? Fifteen minutes at the beach, ten minutes to set the bombs and get out of the building. She looked up and down the hall. She could place some, but not all, of them if she wanted to make it back to the beach before the door closed. She had to set as many as she could. She scooped up the pouch and tied it to her belt loop, jogging to the next door. It only took five tries to rip the paper backing off before she could stick and press. She pulled a disc out and started on it on her way to the next door when she got into a rhythm. She watched the timer closely as she activated each one. Eleven and a half minutes, the clock said, and that’s all the time she had. She sprinted down the hall, back into her workroom, and jumped up onto the conveyor belt. She could still feel the cool breeze and smell the fish and salt. She even looked forward to getting to know whoever it was that waited on the other side of the door. She looked down at her cubicle one last time, never would she have to see it again. “Hurry,” she heard from inside the “out” port. She dropped to her knees and crawled toward the beach, only to hit her head on a cold, metal door. Thanks again for reading along. I hope to see you back again next Saturday and throughout the week. And don’t forget, the full novel is available through here.